I recently had the opportunity to get my hands on Sky-Manufacturing's new dual case crossmember for Toyota trucks and 4Runners. Looking to address several problems with one part, they did it in style. For starters, this is one seriously heavy-duty replacement for the stock transfer case crossmember, gaining strength and increased ground clearance combined with tough skid plating action all in one. Sky's crossmember also makes use of ability to use 2 of the stock rubber mounts. This can significantly help control the effects of torque from a dual case setup, as well as helping control motor mount failure. The kit comes with everything you need, and you can tell how beefy this thing is when you go to open the box! 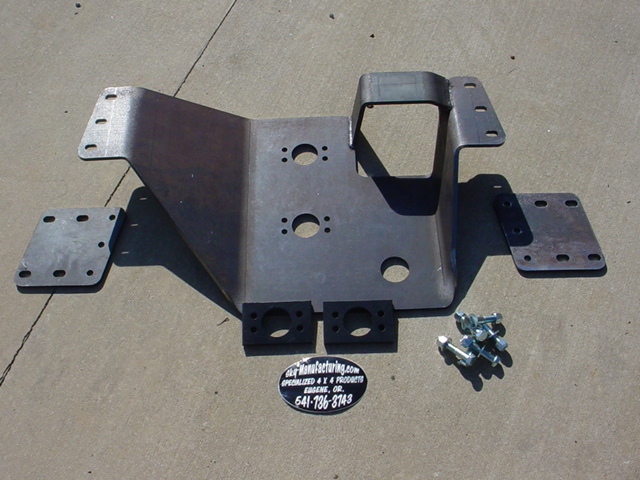 Crossmember center plate, frame plates, attachment hardware, transfer case mount spacers, and countersunk hardware for the mounts are all included. Just paint to suit your needs and get ready to install. Installation is easy and fast, starting with removal of your stock parts. 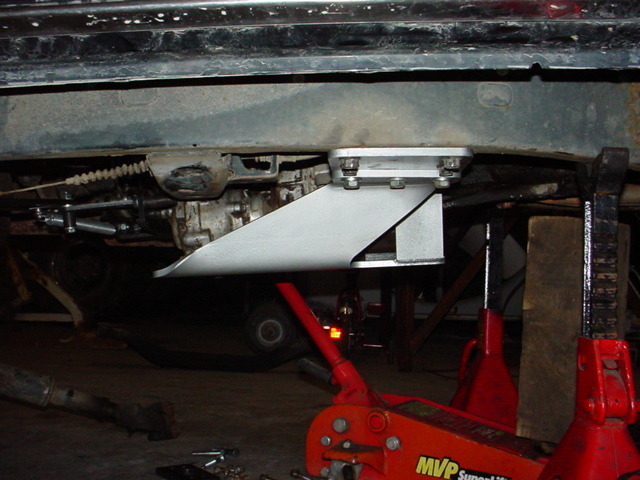 Support the transmission and transfer cases with a jack or stands, then remove the stock crossmember. Disconnect the driveshaft at the transfer case, since Sky's new crossmember has a strengthening loop that goes over and around the driveshaft. Here is where the adjustability of the Sky Manufacturing dual case crossmember comes in. 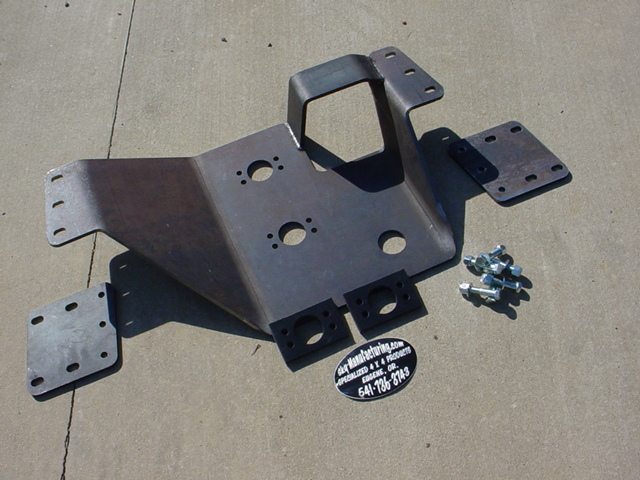 The side plates - in conjunction with the included mount spacers - allow you to adjust the height of where you mount the crossmember, and consequently where you mount the transfer cases. Placing the side plates on the frame with the crossmember above them an using the mount spacers puts the transfer cases at the stock height. If you need it lower, simply mount the crossmember below the side plates. If you want it higher that stock (and have the room), Sky-Manufacturing has additional spacers available to raise the crossmember further above the side plates. Then use the mount spacers as needed to get a good fit. Sky has also re-designed the side plates for additional slotted holes to allow even more adjustability - side to side *or* front to back to assure a good fit. To make use of both of the transfer case mounts this kit will allow, you may need to pick up an extra rubber mount from a parts yard or other source. As I said, this can really help to firm up the movement the drive train sees from the added torque of a dual case setup. Underneath you will find a smooth bottom for sliding over trail obstacles, thanks to Sky's use of countersunk hardware to attach the transfer case mounts to the crossmember. An access hole has also been placed to facilitate use of the factory transfer case drain, making for easy maintenance. With the Sky-Manufacturing crossmember at the height you need, all hardware in place and tightened down, re-connect the front driveshaft and call it done. You are ready to hit the trail enjoying increased ground clearance, protection from the rocks and other trail obstacles, as well as improved mounting for your drive train.